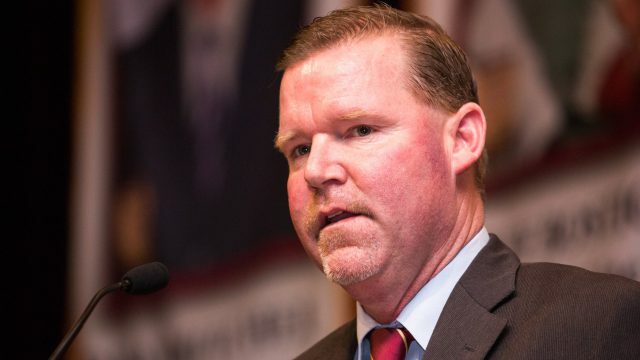 After weeks of speculation, the Redskins fired General Manager Scot McCloughan on Thursday, a little more than two years into a four-year contract, the Washington Post reports. An official with direct knowledge of the situation attributed the decision to McCloughan’s ongoing problems with alcohol, which also led to his firing from front office positions with the San Francisco 49ers in 2010 and Seattle Seahawks in 2014. McCloughan, the official said, has received alcohol treatment since joining the franchise in January 2015, but he hasn’t actively worked for the team in weeks. Even before McCloughan left Redskins Park abruptly late last month, the official said, he had already been placed in “timeout” because of his behavior. “He didn’t make the best of his third chance in the NFL,” the official said, alluding to the two previous jobs McCloughan has lost for alcohol abuse. Neither McCloughan nor his agent Peter Schaffer could immediately be reached for comment. Once the COOKE’s were ousted from ownership, I relinquished my tickets. Though I never bought season books, I did attend individual games. Now, I have been a loyal fan since 1949, the first season they were telecast on t.v., and I will continue to be a fan. But I no longer will buy REDSKINS paraphernalia, and I have forbade my children and grandchildren to do so on my behalf. McCLOUGHAN was the first really effective GM this team has had since BOBBY BEATHARD. Who incidentaly, left in a similar fashion after butting heads with the head coach. I do believe the owner cares about the club. But not because there’s a genuine interest in the fans living in the DMV or REDSKINS fans in general. Rather his regard appears centered in his own personal pride and the money he can make from the franchise which reminds me of where I came in with a similar huckster, GEORGE PRESTON MARSHALL. The team was eminently successful until the players and league saw MARSHALL for who he was, a miserly mean-spirited bigot who would never improve the club for the love of the game of football or the fans who followed it. And so eyes are now focused on DAN SNYDER questioning whether the same ilk resides once again at the top of this franchise. As long as the focus is on the ownership and not the fans, this franchise will continue to be an ineffective football club. I don’t care if SCOT was a fall-down drunk 24-7, the guy could pick talent, and build winning teams. Something the REDSKINS front office has not had since BOBBY BEATHARD. Reading THOM LOVARRO’s column on the behind the scenes management intrigue in the TIMES this morning, I simply look back to my past posting here. The problem with this franchise is the ownership. After destroying the championship prospects of this franchise for a decade with RGIII, and the insane deal to grab him in the draft behind the “uncapped” debacle, the NFL should pressure SNYDER to sell. Barring that, the only recourse is to stop attending games, or buying REDSKINS paraphenalia. Unless the revenue stream ceases, SNYDER will persist as the head of the ownership group because of his controlling interest in the franchise. OT – Javarious Leamon -South Carolina State. CHRIS CARTER in, TERENCE GARVIN out. Hopefully D-Line coach TOMSULA will be better than AKEY, and DC MANUSKY better than the guy who left. TORRIAN GRAY should be an upgrade over PERRY FEWELL in the d-backfield. Looks like we’re not getting a big NT run-stuffer unless it’s in the draft. Without interior run defense last year, the ILB’s and safeties were run ragged trying to defend both the run and the pass. So no more big news in FA unless another JOSH NORMAN drops into our laps? Pick value in round one then for need afterward. This club has to be choosy after round one. They need “football players”, but in selected slots. 220 – QB JOSHUA DOBBS Tennessee depending on first round. TY NYSECKE in the house. WIL COMPTON and CHRIS THOMPSON need to be signed. Sign GOLSTON if no #17 DT pick in the draft. GREG TOLER and a mid-round pick @ CB. DUKE IHENACHO and a first or second round pick @ S.
Draft a mid-round guard and center. Draft a low round RB. A second or third round ILB depending on earlier picks. I would not resign DT CULLEN JENKINS, ILB TERRENCE GARVIN, or SS DONTE WHITNER Jr. Still saying the REDSKINS will improve this season. No matter who they pick @ # 17. I think MAURICE HARRIS is the reason the REDSKINS let PIERRE GARCON walk. With PRYOR, DOCTSON, and HARRIS at wide-out, CROWDER in the slot, REED, DAVIS, and PAUL at TE, the REDSKINS will put up some serious numbers in this upcoming season, especially in the red-zone. Finish the o-line rebuild with a find in the fourth round at left guard, resign JOHN SULLIVAN, and pick a low round RB to replace MARSHALL and MACK. Would SNYDER-ALLEN-GRUDEN take a chance on COLIN KAEPERNICK and trade COUSINS to the BROWNS for the #1 overall pick and a second next season? DE MILES GARRETT and OG FORREST LAMP. That would be a great first round this season, but KAEPERNICK, McCOY, and SUDFELD at QB? With the firepower of a great RB pick in the second round, it might work. So ALLEN signs KAEPERNICK at the end of the FA period. COUSINS is traded for the BROWNS #1 and #52 in this draft.